The Cisco® RV042 Dual WAN VPN Router is an advanced connection-sharing network solution for your small business needs. Like any router, it lets multiple computers in your office share a connection to a public or private network. However, with dual WAN ports, the Cisco RV042 lets you use a second connection as a backup to help you stay connected, or it can be used to access a second provider to increase available bandwidth and balance traffic. The Cisco RV042 also features a built-in 4-port full-duplex 10/100 Ethernet switch to connect four PCs directly, or you can connect more hubs and switches to create as big a network as you need. The VPN capability creates encrypted "tunnels" through the Internet, based on IP Security (IPsec) or Point-to-Point Tunneling Protocol (PPTP), allowing up to 50 remote offices or traveling users to securely connect into your office network from offsite. Users connecting through a VPN tunnel are attached to your company's network -- with secure access to files, email, and your intranet -- just as if they were in the building. You can also use the VPN capability to allow users on your small office network to securely connect to a corporate network. 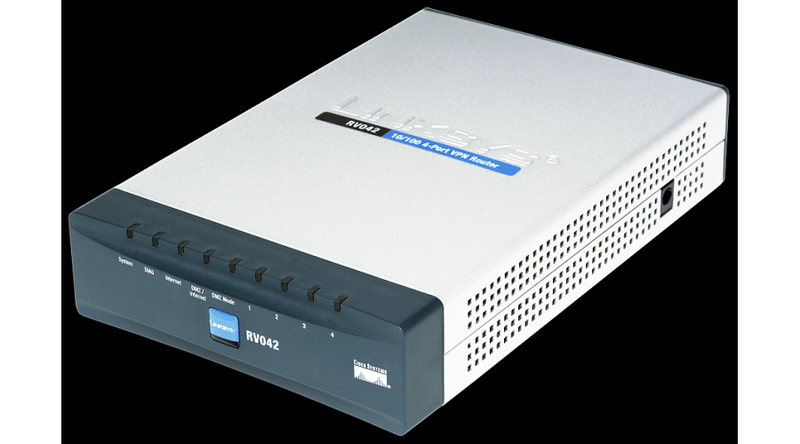 The Cisco RV042 can serve as a Dynamic Host Configuration Protocol (DHCP) server and has a powerful stateful packet inspection (SPI) firewall to protect your PCs against intruders and most known Internet attacks. It also supports the Trend Micro ProtectLink Gateway Security Service, which enables you to dynamically block unwanted or unsafe URLs and emails. Configuration is a snap with the web browser-based configuration utility. As the heart of your small office network, the connection-redundant Cisco RV042 Dual WAN VPN Router gives you the connection reliability your business needs.